I love referring to having a curated YouTube playlist of Korean kids’ videos for my kids to expose them to Korean language and culture (and give me an uninterrupted hour on a weekend). Cloud Bread ranks high for me on this playlist while sitting in the middle for my kids. Cloud Bread or 구름빵 is a gentle tale about two sibling cats who sneak out of their house one rainy morning. They discover a small cloud caught in a tree and come up with the idea of bringing it home to their mother who … makes delicious Cloud Bread. They all start flying as a result of eating it, and the two cats decide to fly some over to their dad who is stressed out to get to work in time and stuck in traffic. They manage to squeeze him out of his crowded bus and get him to try the cloud bread which allows him to fly into his highrise office just in time for his first meeting. I discovered the TV show before I realised that it was based on a book published in 2004 written by Hee Na Baek and illustrated by Hyang Soo Kim. (Here’s a link to a WSJ article on how President Park reprimanded publishing houses on their common practice of squeezing first-time authors such as Paek out of profiting from her book’s huge success.) 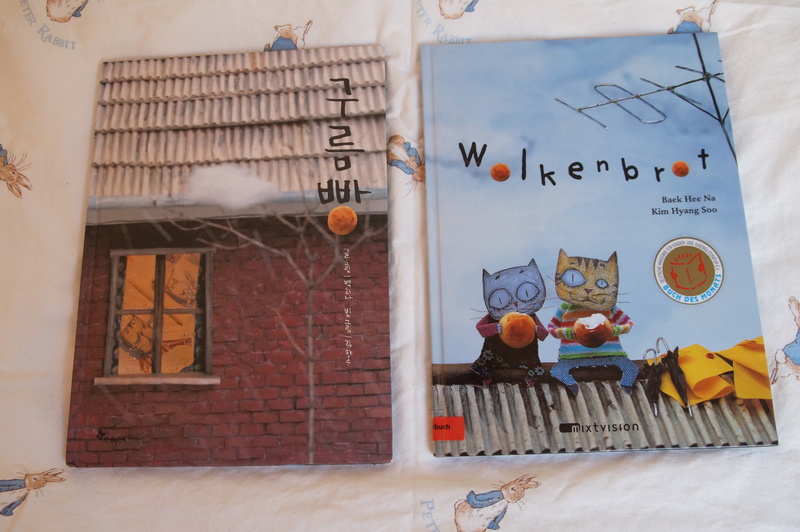 We got a copy of the book when a family friend left Aalen to move back to Seoul and gave us all of her daughter’s outgrown picture books. Cloud Bread with its beautiful paper cut out illustrations is a sweet story. I was delighted to find it translated in German at our small local library here in Essen Werden! My three-year-old son asked me to read the Korean version to him the other night. As I was looking at one of the double page spreads of the whole family sleeping on the floor in one room, I took in the thin Korean-style mattress called a yo (요). I felt nostalgic missing the girlhood days when I would sleep on one of these with my grandmother while also appreciating this detail of Korean family life in the book. There are of course many more: the father hurrying off to work and being crammed in a bus. The slow-moving, morning traffic. Even the mother in her apron making a hot breakfast. And finally, the shingled roof top of the house. I not only love the images because they are nostalgia-inducing, but also because they are so Korean. It occurred to me that I need to give this book to each godchild of ours and that this was an answer to my personal We Need Diverse Books campaign in Germany. 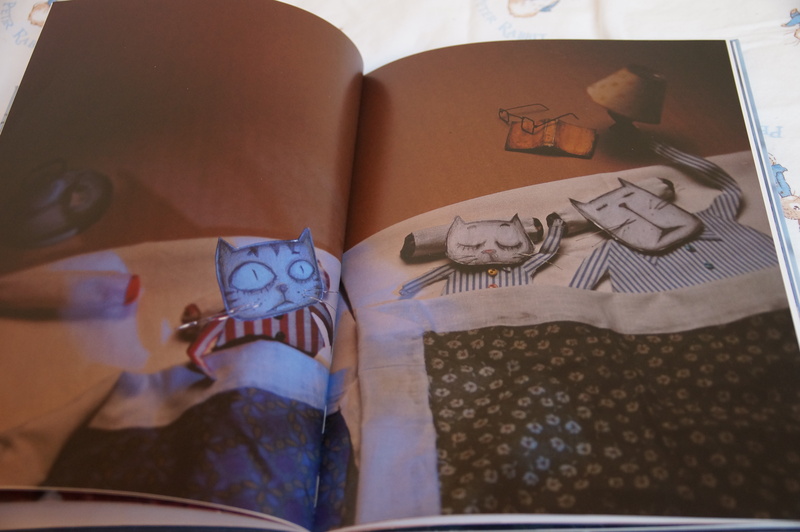 I loved that this was a real book, not just a Korean book – a real story about a real cat family (you know what I mean). It has that perfect recipe of relatable characters, adventure, tension and challenge, and a whole lot of fantasy. At the end, the kids save the day. The German version of Cloud Bread, or Wolkenbrot, is an excellent quality translation. When I read it in German, I appreciated even more that elusive combination of great story, beautiful yet fun illustrations and background look into a different culture that makes a successful picture book. All while remaining stereotype free. Tags: Baek Hee Na, Cloud Bread, diasporic parenting, 구름빵, German translation, Jane, Korean books in German, Korean culture, picture books, teaching Korean to kids, translating Korean picture books, We Need Diverse Books in Germany, WNDB, Wolkenbrot, writing picture books, YouTube for language learning. Bookmark the permalink. I agree wholeheartedly! I enjoyed your blog post. I would love to get more book recommendations of Korean stories translated into English or German from you. I want to read these books to my students (age 4- and 5 years old). I am always on the look out for more diverse books to use with my students. Thanks so much for this post! Thanks for reading and commenting! I would say that any Linda Sue Park books are great. She’s written both picture books as well as middle grade books worth reading and heavily influenced or about Korean themes. I also am a HUGE fan of Grace Lin. She has also written picture books, chapter and middle grade books that I love reading with my own kids. As a parent I appreciate both of these authors, but they have also influenced me as a writer on how to weave in diversity to a story with sensitivity and art. I love this post! I would also love to pick your brain for more picture book recommendations of Korean stories translated into English or German. My students are four and five years old. I am always on the look out for more diverse books that I can use with the children to make my classroom more inclusive. I was surprised with my little local library at how many bilingual books they have. I love it when children’s books get translated, and this one sounds so wonderful. Great Post! While I didn’t grow up with much Korean literature (German translation of Korean fairy tales sums it up) but I would love to expose my 1/4 Korean daughter to Korean literature. I think this landscape is thankfully changing quickly. The Korean publishing industry is quite enormous so I hope that generates more good work in good quality translation in both German and English as well. Thank you for stopping by and commenting and good luck with the #diasporicparenting of your daughter!